The Sacred Paddle was part of this year’s annual Deer Island Memorial. Organized by the Natick Nipmuc Council, each year there are activities to commemorate the forced removal of Native people from their homes to an internment camp on Deer Island. This happened on October 30, 1675 to the residents of the Natick Praying Plantation. Natives living in other English-style towns soon followed. All told, approximately 500 Christian Indians were incarcerated on the island without shelter and little supplies. Half of the prisoners perished on the island, their graves now marked by a sewage treatment plant. The Sacred Paddle followed the route the Naticks took from Watertown (where they boarded boats for the harbor) to Deer Island. For the first time in perhaps a century or two, three mishoonash, or dugouts, the traditional watercraft of the Nipmuc peoples, would travel down the Charles River and across Boston Harbor to Deer Island. A Penobscot War Canoe accompanied the mishoonash on the journey. 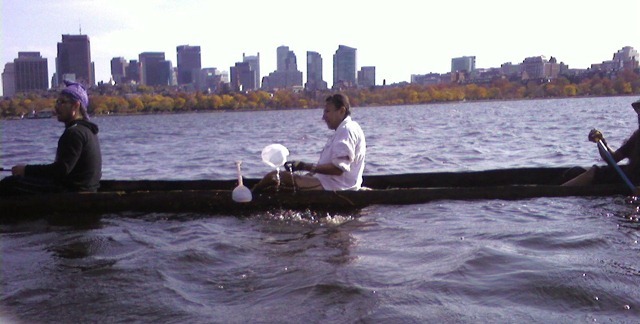 Marcus Hendricks and Troy Philips (and part of Annawon Weeden) in one of the mishoonash on the Charles River. I had a seat in the War Canoe. While I am certain that the fear I felt was nothing compared to my ancestors’ fears, I was pretty shaky. Once we were on the water, everything changed. Cisco Homestead Restoration is Underway!